A clear vision statement sharpens the focus. 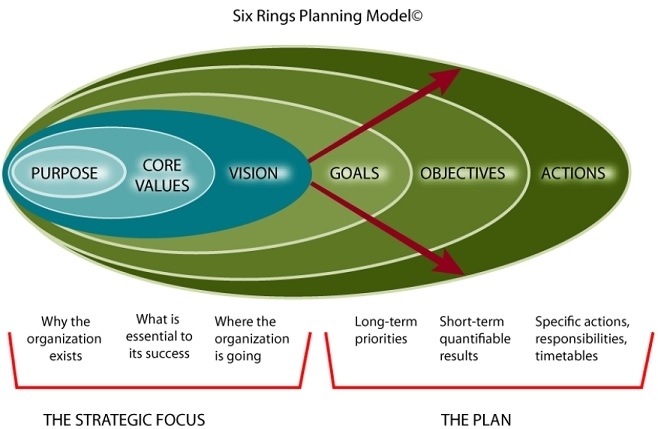 It says “here’s our direction, here’s where we’re going, here’s how we’re going to change the world.” Vision is the third ring in the Six Rings Planning Model. Southwest Airlines: To make air travel cheaper and more convenient than auto travel. Curves: To make it affordable and easy for women to be physically fit. HSBC Bank: To be the world’s local bank. Avon Products: To be the company that best understands and satisfies the product, service and self-fulfillment needs of women – globally. Macy’s: Our vision is to operate Macy’s and Bloomingdale’s as dynamic national brands while focusing on the customer offering in each store location. Toyota: To become the most successful and respected lift truck company in the U.S.
Wal-Mart: Worldwide leader in retail. Microsoft: A personal computer in every home running Microsoft software. Vision needs to be linked to a clear understanding of the strengths and assets of the organization along with the opportunities in the marketplace. Often it means a dramatic shift in focus and direction. Occasionally it requires a full-scale revamping of the company’s business model. Typically, it takes months to develop a fully-understood and fully-realized vision. The first step is to decide on a time horizon. For some organizations, vision spans a ten-to-fifteen year period. But in others a shorter horizon – three years – is just fine. At Teradyne, a fast-moving maker of software that monitors web performance, the time horizon was one year. Why? Because the software industry was moving so quickly its CEO didn’t see any value in planning beyond a 12-month time horizon. 1. What are our strengths as an organization? What do we do exceedingly well? 2. What are our weaknesses? Where do we consistently fall down? 3. What are our opportunities? What’s new that we could be capitalizing on? 4. What are the challenges? What alternatives to our products and services do our customers have? How are those alternatives changing? 5. Who are our primary customers? Who are the people for whom we are trying to create the most value? 6. What trends are affecting our customers? How might their perceptions of the value of our products and services change over the next three years? 7. Are we focusing on the right customers? What would happen if we shifted our customer focus? What could we do more of (or less of) to create increased value for our customers? 8. What is our current business model? how do we create value for customers? how does that translate into profitability? 9. What might be some essential innovations in our way of doing business that would create added value for our customers? how could we re-define our way of doing business? 10. Based on the above, what should be our external vision? What outcomes are we trying to achieve in three years? What are the rationales for that vision? 11. Based on the above, what is our internal vision – how do we envision our organization changing over the next three years to support the external vision? 12. What do we see as the major priorities for change and investment to realize this vision? Once everyone has discussed these questions, you can create a map, laying out the components of your emerging vision. Plotting them on paper enables people to visualize the emerging vision.